A hand held tool powered mostly by electricity but also by compressed air and small combustion engines, used with a variety of attachments for grinding, cutting, polishing etc. Used in every type of construction. The tool gets it's name from the fact that the cutting head is mounted at an angle to the drive shaft of the motor. Consumable disks that are fitted into various power tools. All grinders, air powered or electric rev FAST. For example a 100mm grinder like the one above has a no load speed of 11,000rpm. 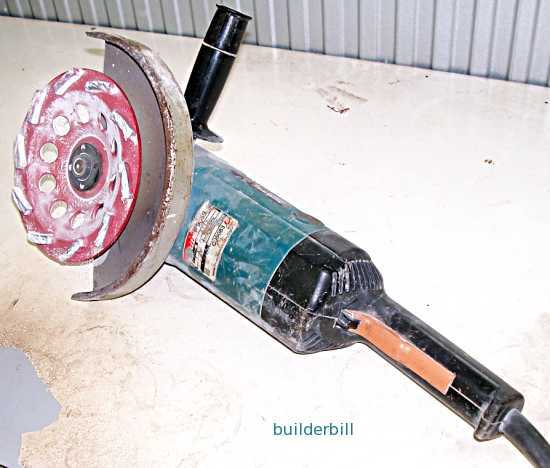 A 230mm grinder like the one below may rev at 6000rpm. 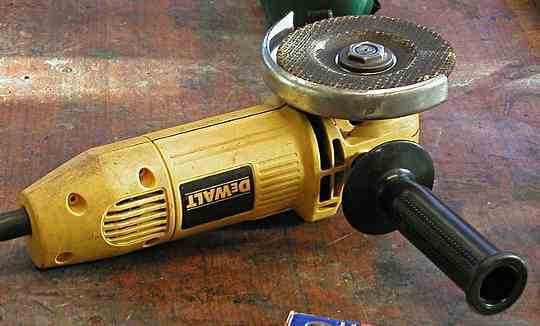 A grinder is not the same tool as a disk sander which can look almost identical. Disk sanders rev SLOWLY. A 180mm disk sander/polisher may rev between 1500rpm to 4000rpm. Always check the speed rating of the blade or disk that you put into a grinder. If you use something that is rated at less RPM then quite possible it can shatter. DO NOT use worn down blades from slow revving machines, for example a 355mm metal chop saw revs at 4500rpm. 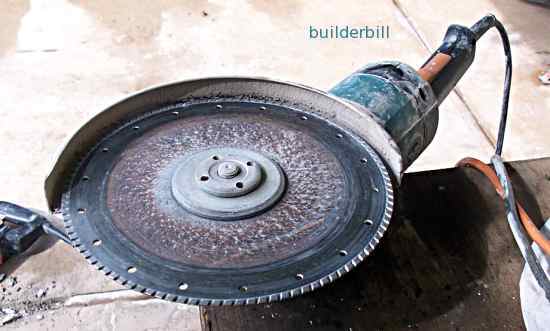 It is possible to use a worn down disc in an angle grinder... BUT IT IS DANGEROUS. You will be exceeding the recommended rpm. As usual with this type of tool heavy protective clothes (I use a leather apron) and hand and eye protection must be worn when using these tools. A small one hand operation grinder with a wire brush attachment for cleaning up steelwork. In particular this set-up is good for cleaning welds. The photos on this page show a selection of the accessories that can be used in this most versatile of tools. The photos also show two of the most popular sizes. The 100mm (plus the 115mm) ones are fine for single handed use, while the larger ones at 225mm carry a lot more punch and need both hands to use safely. 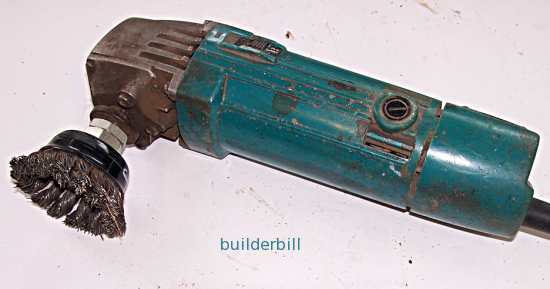 A 225mm Makita electric grinder with a so called Turbo diamond disk for rough grinding of concrete. Angle-grinders are used extensively by rescue services for cutting steel etc. and in these cases they are either air driven or with small combustion engines. 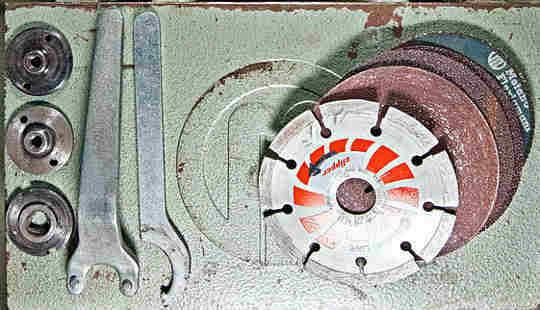 Above is a grinder with diamond saw blade used for cutting concrete. 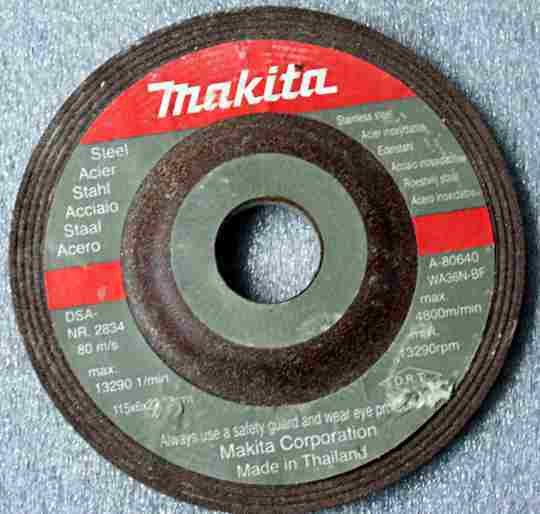 This is an example of a Straight grinder blade. They are designed for cutting. They are NOT designed for grinding. There are many types of abrasive blades to suit this set-up. 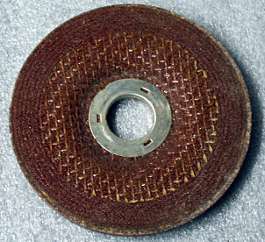 Above is what is know as a Depressed Centre grinder disk. These disks are designed for grinding surfaces and edges. They are thicker and stronger than cutting disks. They allow for fairly flat angle of work. The details on the back as seen above are all important in selecting the right disk for the job. The material that the disk is designed for is clearly stated. This one is for steel, it will not work as well on Stainless Steel and it will be useless for brick or concrete. Many disks just say concrete or masonry, but if you are cutting stone then search out a correct disk. It will make a difference in performance and longevity. The rated speed of the disk is clearly shown in more than one fashion, RPM and M/min. The hole diameter is given and care must be taken to make sure that the disk fits snugly onto the machine. The hole sizes do vary but many of the disks come with extra packing rings to suit the grinder manufacturers arbor sizes. The angle grinder is a potentially dangerous tool and the guard should always be used and it should be turned to the best position to guard the user from sparks. Usually it is mounted with a ring joined with a screw and nut and loosening the screw allows the guard to rotate. Every angle grinder comes with it's own set of tools, nuts and backing plates to change the blades and disks. There is a spanner to hold the shaft from turning and one to move the face nut.